Celebrate National Nutrition Month at Work! 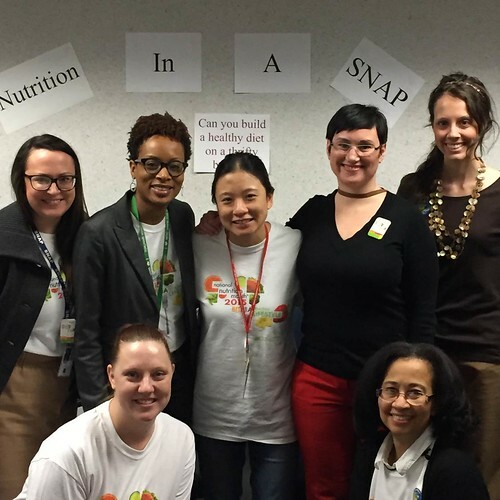 USDA nutritionists host worksite wellness events for their colleagues during National Nutrition Month and throughout the year. In honor of National Nutrition Month®, MyPlate is sharing resources to help you bite into a healthy lifestyle everywhere you go! This blog highlights resources related to healthy eating at work. Learn about healthy eating at home here. Practice healthy habits at work! Throughout the work day, find ways to eat healthy and be active. Whether you pack your lunch or grab takeout, make half your plate fruits and vegetables and choose whole-grain when available. Keep healthy snacks on hand, such as low-fat yogurt, a trail mix of dried fruit and unsalted nuts, or hummus dip and veggies, to help you resist the office candy bowl when hunger strikes. It’s also important to make time to be active, especially if you spend most of the workday seated at a desk. Take activity breaks or schedule walking meetings with your colleagues. Healthy choices like these will keep you energized and able to put your best foot forward. Many employers now offer worksite wellness programs to help keep their employees happy and healthy. The SuperTracker Worksite Wellness Toolkit provides weekly wellness activities and tip sheets which can be used to support employee health and wellness efforts. To learn more about healthy worksite programs and how to start one at your office, access the free National Healthy Worksite Program from the Centers for Disease Control and Prevention. Stressful work days can often keep us from meeting our healthy eating and physical activity goals. Stay on track by getting healthy reminders during your work day. Sign up for MyPlate’s Tip of the Day to receive healthy eating and physical activity tips, recipes, and other helpful resources right in your inbox! You can also stay up-to-date with the latest nutrition information on Twitter. Follow @MyPlate! Discover more National Nutrition Month® resources at ChooseMyPlate.gov! Worksite wellness events encourage employees to eat healthy and be active, building healthy habits that can be maintained beyond the work day! 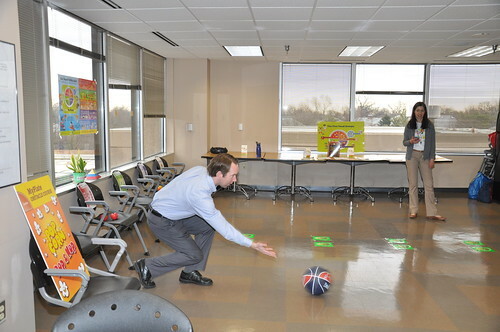 Shown here a USDA employee participates in a MyPlate relay activity.